Paying $500 for Black River Ale tray in top condition. interested in buying vintage Black River Ale Trays! If you’re selling please contact me. Black River Ale Tray Wanted! Haberle produced this tray in the 1940s, though I don't know for how long. I assume for a very short period of time since it is very difficult to come by. 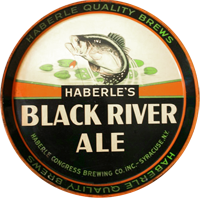 Black RIVER Ale was an immediate successor to Black BASS Ale, which was produced until 1939. Both brands used an image of a jumping bass in their branding. Curiously, items bearing either name arbitrarily depict the fish facing left in some applications (tray, coaster, bottle), then facing right in others (coaster, bottle). I don't know the specific history behind the name change but can only speculate that it was the result of some legal manuevering by England's Bass brewery attempting to stake an exclusive claim to use of the name ‘Bass’. In any case, the tray is very graphic and very desirable and I would love to obtain one. The Haberle Congress Brewing Company operated under many names as far back as 1865 in Syracuse, NY. They were prolific producers of both brews and advertsiing upon commencing brewing again after Phohibition. Pre-Phobition items are, of course, much harder to obtain but the brewery did produce some beautiful reverse-on-glass and tin signs, porcelain corner signs and a few trays. They also produced a rare Prohibition era Congo tray that advertised their near beer. After 1933 they issued many beer cans, beer trays, signs, coasters, smalls and labels. Some of their early cone top beer cans and the Congress color series flat top beer cans are very desirable. Brands they brewed (but not necessarily canned) besides those mentioned above include Haberle Ale, Beer and Bock, Derby Ale and Porter, Congress Beer and Ale, National Ale, and Steinbrau Beer. The brewery closed in 1961 and was demolished three years later.